Sometimes, Uber just isn't fast enough. 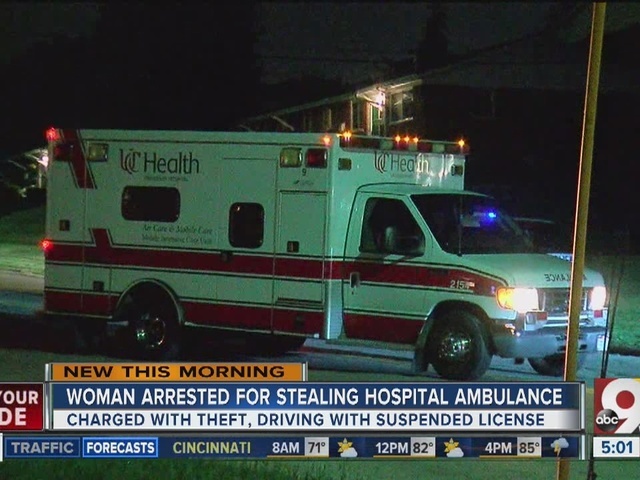 A woman stole an ambulance early Friday morning and drove herself back to her home on Meredith Drive after being released from Deaconess Hospital in Clifton, according to police. While a paramedic was inside dropping off another patient, police say 43-year-old Lisa Carr walked outside, got into that ambulance and took off. Carr then drove nine miles home, where she was taken into custody after police used GPS to track her down. She's been charged with auto theft and driving with a suspended license, and she could be charged with failure to comply by Springfield Township Police for not pulling over on Hamilton Avenue when instructed. Police are still trying to determine the woman's mental health condition. She remains in custody awaiting her arraignment.